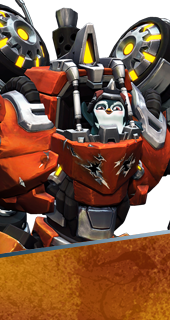 Toby is a Hero in Battleborn. He is unlocked at Command Rank 24 or by winning 5 matches as a hero from The Rogues. Launches an Arc Mine, which arms after a brief delay, dealing 60 area damage per second for 8 seconds. Afterwards, Arc Mine will explode for 90 damage. Deploys an energy field that blocks 750 enemy damage. Firing a Railgun shot through the field increases projectile velocity. Transform your mech to charge up a powerful laser that deals 120 damage a second for 6 seconds. Double-jumping while holding a direction grants Toby a quick boost in that direction. Boosters hold a total of 3 charges that recharge after 8 seconds. Rather than a single focused beam, Core Discharge charges up three blasts firing one after the other, dealing 150 damage per blast.